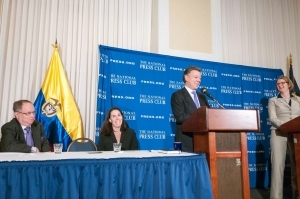 NPC President Angela Greiling Keane, far right, looks on as Juan Manuel Santos, president of Colombia, answers a question at a National Press Club Speakers event on Dec. 3, 2013. Also shown from left are NPC Vice President Myron Belkind and Alison Fitzgerald, chairman of the Speakers Committee. Juan Manuel Santos, president of Colombia, laid out his agenda to advance his country's economic, political and social transformation during an appearance at the National Press Club on Dec. 3. Santos spoke in detail about his historic, and controversial, peace talks with the Revolutionary Armed Forces of Colombia, also known as FARC, and other rebel groups that had been at war with the government for nearly a half century. Counterterrorism efforts supported by the United States' Plan Colombia program beginning in 2000 and years of military victories had weakened the rebels and removed key leaders. It was time for peace talks because "every war has to end with some kind of negotiation," Santos said. The peace negotiations are moving ahead slowly in Havana, Santos said. The agenda has been agreed upon as have two of the proposed agreements, he said. The first agreement dealing with rural development is critical. There are areas of extreme poverty that are home to most guerrillas, Santos said. The second agreement prepares a pathway for the rebels to become full participants in the nation's political system by detailing how they will participate and "the transition from bullets to votes, from arms to arguments," Santos said. Current negotiations are focused on drug trafficking, an area that has had strong support from the United States' Plan Colombia Program. The U.S. has been a top consumer of illegal narcotics, Santos said. The rebels have long claimed that they are not involved in drug trafficking but "that they do profit," he said. The rebels must now join forces with the government against drug trafficking, he added. Santos is dedicated to establishing Colombia's position far beyond the historic security issues that have consumed the nation for many decades, he said. "Making war is more popular and easier than making peace. I can tell you because I have been on both sides as minister of defense and now as president," Santos said. As he builds conditions for peace, Santos has brought in political rivals -- "as did President Lincoln" -- to join his efforts to transform Colombia and build a strong economy, he said. Not only is cocaine (coca) production at historic low levels, but a multi-tiered program to raise people from poverty conditions is being to show results, Santos said. Following Peru, Colombia has the best performance in the region to fight poverty and extreme poverty, he added. Colombia has created more jobs than any other country in Latin America, Santos said. The government of Colombia reports that it has moved 1.3 million people out of poverty. Colombia's economy is growing at an average of 5 percent and has grown steadily for 40 months. Its inequality and social-injustice issues have greatly improved, more than any country except Ecuador, he said. Still, there are 2 million unemployed and 30 percent of the population live in poverty, he added. Santos plans to connect Colombia municipalities with broadband and fiber optics and continue to combat poverty. A few years ago, Colombia was drifting in its international relations, Santos said. The country was on the verge of war with neighboring Ecuador and Venezuela. The Santos administration met with Venezuelan President Hugo Chavez and calmed relations with the other nations, Santos said. Long-stalled free-trade agreements with the United Stats and Europe are now bringing greater economic opportunities to Colombia, Santos said. He boasted of good relationships with President Barack Obama and congressional leaders of both parties. Meetings now focus on cooperative ventures in education and technology. During his two-day visit to Washington, President Santos held meetings with President Obama, members of Congress and the Organization of American States. He also addressed the InterAmerican Dialogue and several think tanks. After his Press Club speech, with its customary question and answer session, he held a Spanish-language media briefing for international press outlets. Santos was first elected in 2010 on a platform of continuing the offensive against the leftist guerrillas. He wrote Check on Terror detailing important actions against the FARC during his tenure defense minister. He recently announced his plans to run for reelectionm in 2014, fully aware that the peace process will be the hallmark of his presidency. He is cautiously optimistic about the success and said his economic and democratic models are not negotiable. Prior to entering government service, Santos was a columnist and deputy director of the newspaper El Tiempo and was president of the Freedom of Expression Commission for the Inter American Press Association. He has published several books including The Third Way, co-written with the former British Prime Minister Tony Blair.